We are at the Monte Rose hut at 2,883m, the afternoon before our planned ascent to the Dufourspitze summit. Our plans are thrown into disarray: we’ve carefully thought out our route, and now we get this news. 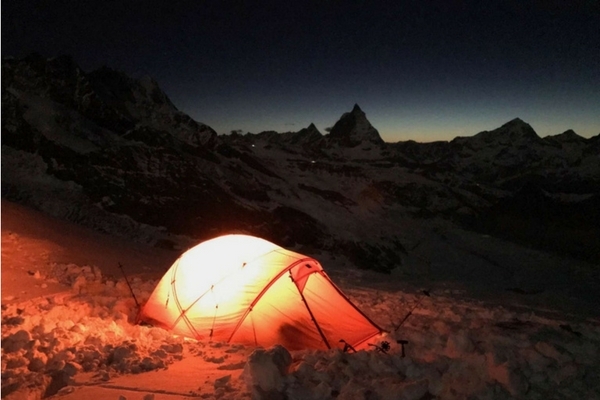 We change our ascent route and take our F10 XPD3 with us up to 3,300m as our basecamp. It offers excellent protection against the elements and is well worth carrying its weight, especially as we split the components between the group. 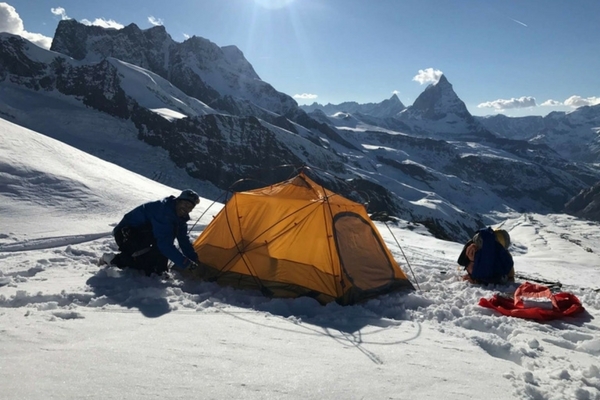 Once there, we camp with probably the best view in the entire Alpine area: Dufourspitze, Liskamm, Pollux, Castor, Breithorn and Matterhorn as a sort of bedroom panorama. There is literally nowhere else in life that I would rather wake up to, nor anywhere as breath-taking. The ascent starts at 5:00 am, the sun has not yet cleared the horizon and it is damn cold. Further down we see the first head torches from the Monte Rose Hut throwing shards of light into the darkness. At 8:45 am we arrive at the ski depot and prepare for the summit ridge: a 350m vertical on the exposed ridge, with climbing and abseiling phases. The climb itself is difficult: every 20 metres a short pause and deep breaths are required - at almost 4,400m altitude, every step is a challenge. After 3h 45min we are on the last metres to the summit: at 4,634m, the Dufourspitze is the second highest mountain in the Alps. The view is breath-taking and now all of the surrounding peaks no longer tower over you - as you reach the summit they are suddenly at your feet. As preparation for our expedition to the 6,190m Denali in mid-May to early June 2018, this week's expedition course and the subsequent ascent of the Dufourspitze has been excellent. We can move confidently forward to the next stage in our training for Denali, having tucked another summit under our belt. Thanks to my mountain partners: Ralf, Matthias and Carola.